A founding member of Mamaroneck, New York’s prestigious Winged Foot Golf Club, Kennedy had long been an avid golfer when he met Charles Leonard Fletcher in 1919. When the Englishman told Kennedy that he had played more than 240 courses in his lifetime, Kennedy took it as a challenge and became determined to play more. In a feat that caused the New York Sun to declare him “golf’s Lou Gehrig” in 1935, Kennedy succeeded in beating Fletcher’s record, and then some. He played golf on more than 3,165 different courses in all forty-eight states, nine Canadian provinces, and more than a dozen different countries during his forty-three year love affair with the game. In addition to the 3,165 unique courses he played, the unrelenting Ralph also played golf a total of 8,500 times over his lifetime, the equivalent of teeing it up every day for twenty-three straight years. Lou Gehrig’s seventeen years in professional baseball pales in comparison. This intriguing story includes details of the special conditions under which he was able to play the Augusta National Golf Club and the unique circumstances of his visits to Pebble Beach and the Old Course at St. Andrews. 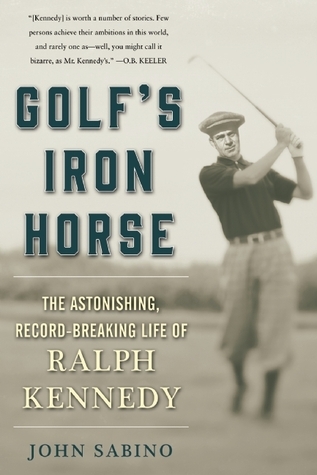 Perfect for golf aficionados, Golf’s Iron Horse will inspire every reader to tee off at a new course.